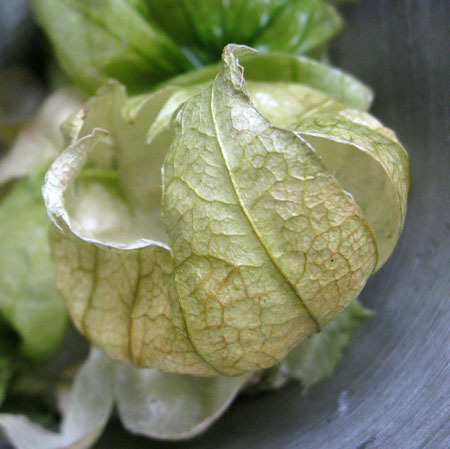 I find the husks on tomatillos charming. I can’t resist taking photos of them. It takes a lot of chopping and dicing to make this salsa, but it’s worth it! In a large stainless steel saucepan, combine all of the ingredients. Bring to a boil over a medium high heat, stirring constantly. Reduce heat and boil gently, stirring frequently, for 10 minutes. Ladle hot salsa into jars, leaving 1/2″ head-space. Remove air bubbles and adjust head-space if necessary by adding more hot salsa. Wipe rim. Center lid on jar. Screw band down until resistance is met, then increase to fingertip tight. Place jars in canner, ensuring they are completely covered by at least 1″ of water. Bring to a boil and process both 8 ounce and pint jars for 15 minutes. You should know that the amounts I’ve given are for one batch, which is ridiculously small. I made 5 batches all at once. If you’re like me and would like to make a lot at once multiply all of the ingredients by five. It’s nice to know you can do smaller batches, though, because if you have a lot of these ingredients in your garden you may only be able to make a little at a time as things ripen. You can use other types of hot chili peppers, according to your tastes. I only have eyes for jalapenos because they don’t repeat on me as much as other peppers. I like serranos too but they tend to be too hot for me. If you used a cup of serranos per recipe I think you’d be breathing fire and then you might die (mostly just kidding). So if you like things hotter, try a blend. Just be sure that the total amount of peppers you use remains the same. You can also use a little more garlic if you like. This salsa is quite soupy. Mr. W wanted to know if it can be made thicker. I’m not sure about that yet. I have to do a little canning research before I know how much I can safely adjust the liquid content. (If I was just making it for fresh eating, instead of for canning, I would just cook it down til it was as thick as I liked). Until I find out, or some other experienced canner gives us the answer, don’t mess with it. It’s amazing just as it is. This entry was posted in Canning and Preserving on June 23, 2009 by angelina. Thanks for recipe! Can’t wait to try it! oooh, this sounds good. I may try these proportions but use my roasted tomatillos for the extra smoky flavor. This sounds great! Do you grow tomatillos? I can’t grow peppers to save my life…maybe Sauvies has a farmer who grows or sells them. I must go consult with Casa De Lulu on how hers turned out when roasting them. I tried growing them last year and they didn’t do well. This year I have a volunteer so we’ll see what happens with that. I pick them at a u-pick here in town. Just wondering if the salsa needs to be put in a water bath? Yes, it does. I’m not at all sure it has enough vinegar to allow you to simply seal it while hot. I wouldn’t risk it. How many pints does one batch make? Is this a water bath method? It sounds like it. I hope so. Not to sure of the pressure canner yet. It is. (Didn’t I say so in the recipe?) I had a pressure canner but I didn’t like the results I got so I gave it away. I might try it again eventually but for now all my canning recipes are for water bath canning safe recipes only. Angelina, to make it thicker, you could take half of the batch and boil it down like you said you would for immediately serving it. Blend it, then add it back to the rest of the batch before jarring it up. That’s a good idea. I might try that this summer! Thanks for coming by my blog and sharing your ideas! I make 40 gallons of tomatillo salsa every day for my restaurant and we always roast the tomatillos with the jalapenos and garlic until charred ontop. This not only increases flavor ten fold, but also can reduce the “soupyness”. I’ve been wanting to try roasting them first – a good friend of mine does it that way too. If I can get my hands on some tomatillos I’ll definitely try it this way before the season is done this year. Thanks for commenting! 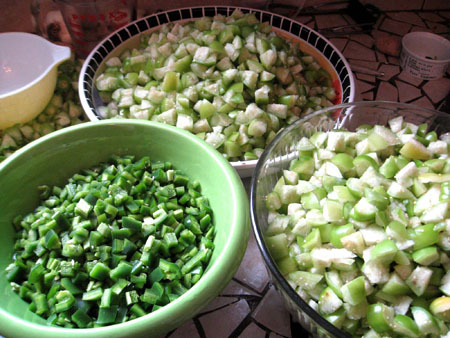 Also – that’s A LOT of tomatillo salsa to go through in a day! Sorry it took so long for me to respond to this. What sauce did you want a recipe for? The recipe for tomatillo salsa that I make is in this very post you’re commenting on! I’m envious you have a crop of them to play with. Good luck to you! What do you mean by coreing the tomatillos ? do they have cores ? Have you ever cored a tomato? Tomatillos are a lot like tomatoes but their core is smaller. It’s on the stem end and is tough – hence the coring. I’m so happy that you like my recipe! 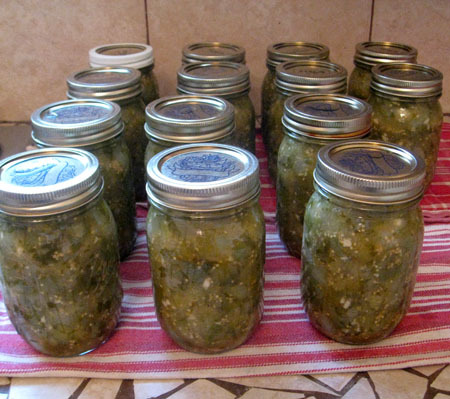 I haven’t made any tomatillo salsa in a couple of years but I’m hoping to make some next year. I’ll try your trick of using the immersion blender when I do.